BBC NEWS | Business | Why did Zavvi go under? Why did Zavvi go under? Zavvi has joined a growing list of High Street casualties in the run-up to Christmas. These include the closures of MFI and Woolworths, which were confirmed last week, while Whittards and The Officers Club went bust yesterday. The outlook for Zavvi's 3,400 staff is not clear, although the stores will be open on Boxing Day. Ernst and Young, the administrators called in by Zavvi, blamed its failure on what they called "the dire trading conditions on the High Street," which led to a "material fall in sales". Zavvi had also been crippled by the collapse of Woolworths group, whose wholesale arm EUK had been its main supplier, and it had struggled to find an alternative source of stock. Zavvi is better known under its former name, Virgin Megastores, the music retailer which was the basis of Sir Richard Branson's business empire. 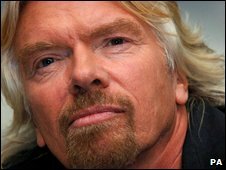 Founding the record chain 1971 in a single shop in Oxford Street, London, Branson soon diversified into the Virgin record label, and then started the Virgin Atlantic airline. He finally sold the Megastore chain to its management team of Simon Douglas and Steve Peckham last year for £1. Mr Branson was said to be "extremely sad" at the failure. "All the good work has been undone by the collapse of Woolworths," he said. There had been speculation that the collapse of Zavvi could cost Virgin up to £100 million as it had guaranteed the cost of stock Zavvi had bought from the Woolworths group. But a spokesman for Virgin, Nick Fox, said that a deal had been done with the administrators of Woolworths who were accepting £40 million to settle the debt. And Virgin was "confident" that cash could be found within the Zavvi group. He said Zavvi had been trading well up, prior to the collapse of Woolworths in November. "They really had been disrupted by the lack of a supplier. Lose your supplier, and you lose your key stock,and that puts enormous pressure on the business," he said. Simon Douglas and Steve Peckham, Zavvi's founders, thanked their employees for their commitment and support since the launch of the company. "We have done all that is possible to keep the business trading, but the problems encountered with EUK, and particularly its recent failure, has been too much for the business to cope with," they said.